I was ahead with my paintings, so I took a few days off to finish a quilt for my son, and a couple more to galavant in Portland! Two highlights from our trip: I saw my book for the first time (with my own eyes) in a real life bookstore (Powell's)! And had lunch with the lovely Nora Bergman, a very fine artist and co-Oregonian! 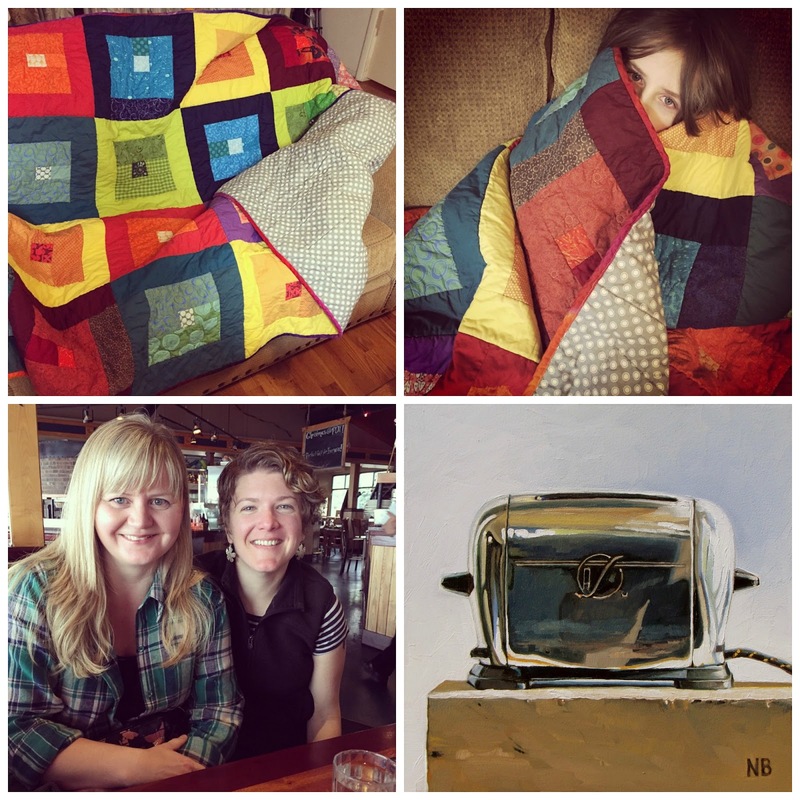 Here are some pictures - top two are my quilt and its new owner, bottom-left is Nora and I, and bottom right is an example of her work. So excited for you Carol! You are such a master of still life! I just borrowed your book from the library's NEW shelves. Read it in one sitting (and even reread some sections). It is such a source of healing and reassurance. I am a late blooming artist, only seriously painting since a diagnosis of Parkinson's Disease 7 years ago. I no longer feel so alone.Highlights for me were Chapters 9, 5, and 11. Thank you and a blessed New Year to you and yours. Amazing rendering of the cellophane bag!! 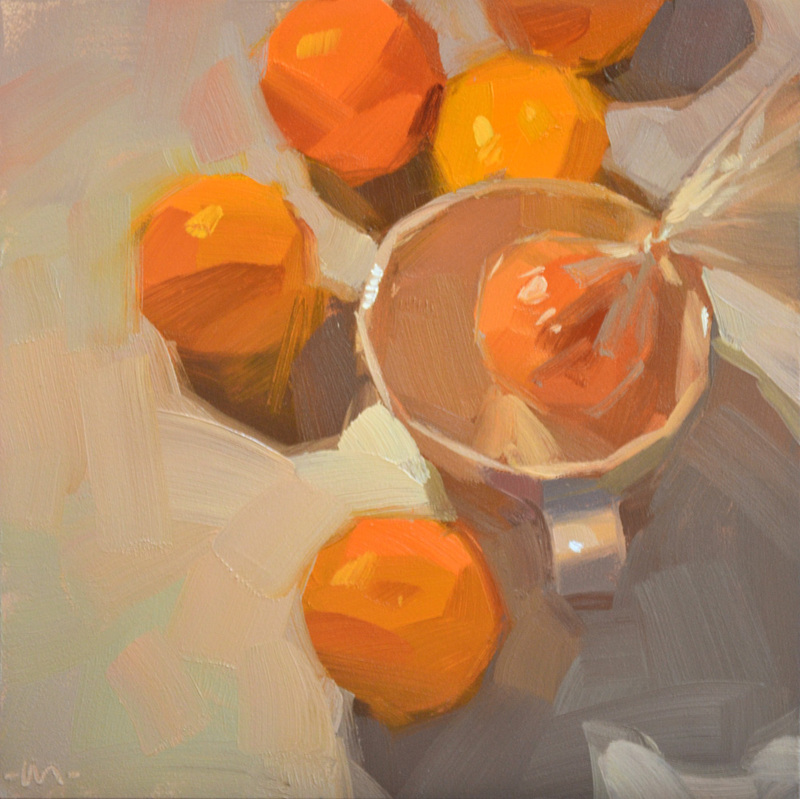 I am very much enjoying your new book and the Daily Paintworks site. I am trying to find the viewfinder holder that you show in your book, the black one with the segmented plastic ball and socket arm. Can you please tell me where you got it? Thanks for the info and the inspiration!! Hi Carol! 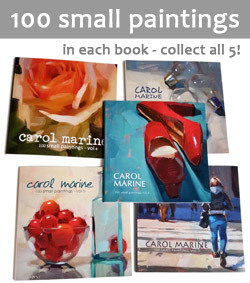 I just started a new painting blog, purchased your book and am halfway through it. I'm loving it. You are such an inspiration and your work is beautiful. Hopefully in the next few months I can work my way up to being a daily painter as well. Very nice quilt! For those of us not so fortunate (thought I would not trade him for anything) I found something called a Chromo Inc Flex Gooseneck Clamp Holder on Amazon that I think will do the trick. Thanks again. I so enjoying your work and your dedication is truly inspirational!